Gardner, R-Colorado, and Sen. Elizabeth Warren, D-Massachusetts, introduced legislation that would keep the feds from interfering in state marijuana regulations, including allowing dispensaries access to banking. 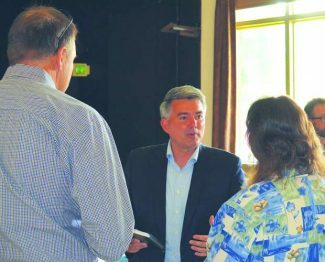 The marijuana industry’s financial regulations should be a state issue, not federal, says Sen. Cory Gardner. The STATES Act, Strengthening the Tenth Amendment Through Entrusting States Act, could come up for a senate vote this week, as an amendment to the appropriations bill. If it doesn’t, then Gardner and Warren will keep working to push their proposed STATES Act into law. The bill would ensure that states, territories and tribes have the right to determine their own approach to marijuana within its borders. • Amends the Controlled Substances Act (CSA) so that – as long as states and tribes comply with a few basic protections – its provisions no longer apply to any person acting in compliance with State or tribal laws relating to marijuana activities. • Clearly states that compliant transactions are not trafficking and do not result in proceeds of an unlawful transaction. • Removes industrial hemp from the list of controlled substances under the CSA. • Prohibits endangering human life while manufacturing marijuana. • Prohibits employment of persons under age 18 in drug operations. • Prohibits the distribution or sale of marijuana to persons under the age of 21 other than for medical purposes. Forty-six states have decriminalized or permit marijuana or marijuana-based products. Federal interference creates legal uncertainty, threatens public health and safety and undermines state regulations, Gardner said. Coloradans passed Amendment 64 in 2012, legalizing marijuana. The umbrella in Gardner’s measure does not cover the Department of Justice, or change marijuana from being illegal under federal law. That means, for now at least, cannabis businesses and consumers could still be breaking federal law. It does, however, cover the Treasury Department, and could shield financial institutions as they work with marijuana businesses. “They’re continuing to push their states’ rights approach,” Casey Contres, Gardner’s press secretary said. Gardner and Warren are working to bring their measure to a vote next week, Contres said. However, they won’t know until next week if it will. “Not all amendments offered receive votes. If it doesn’t receive a vote, they’ll continue to push their bipartisan STATES Act forward,” Contres said.